I ended up being entirely too last-minute with the handmade costume thing, so yesterday Eisley and I made a mad dash to our favorite children's secondhand store to see what we could scrounge up. Lucky for us, all the costumes were 50% off, and we found the sweetest one hanging right on the end of the rack (just waiting for us, I'm sure). 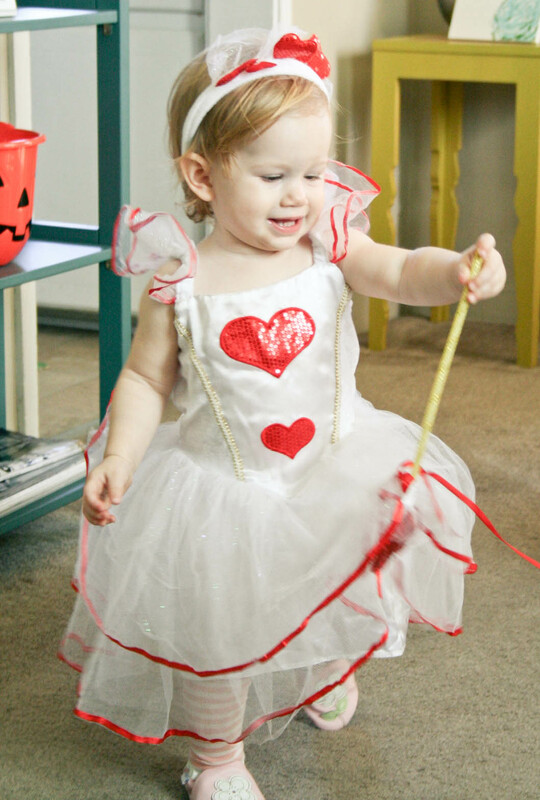 The size is much larger than she typically wears, but when I put it on her, it didn't look awkward at all. (Plus, I like the idea of her having some dress up clothes to grow into.) At the encouragement of the shop owner, Eisley took a peek in the shop's full-length mirror after I'd put the dress on over the outfit she was wearing, and she did her little shoulder-shake dance of approval when she saw her reflection. SUCCESS! I tell you, I seem to have the best of luck with this whole procrastination thing. 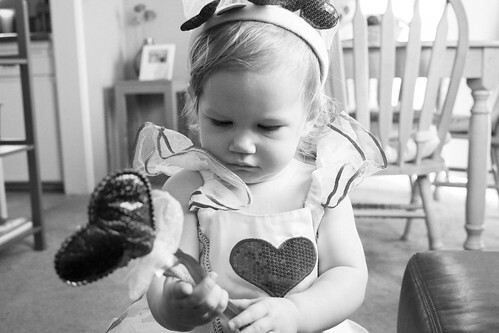 The costume cost only $7 and came with the dress, a silly headband thingamajig, a heart wand, and some wings. The wings were a little snagged, so I decided not to add them to the costume—but I rather like the way it looks without them. With the exception of the wings, the whole thing looks brand new. What an adorable costume! The wand probably makes a fun toy for her too. I love it! I procrastinated on the costume as well and scored a $6 Old Navy fish. Yay! and is her hair a tinge of strawberry?! eeeee! So sweet!!! It looks perfect on her!! !